18 Gallon Plastic Totes With Lids Just $3.98! You are here: Home / Great Deals / 18 Gallon Plastic Totes With Lids Just $3.98! I spent a few years trying to get my Christmas tree and decorations organized for storing. I was always a day late and a dollar short! I would find a deal and they’d all be gone, or I’d give up on the deal and just go looking for the right boxes or bags and they’d be sold out. I had a time. I finally have it all sorted out and boy does it make life easier unpacking and repacking the decorations. I said all that to say – here is a great deal on some storage tubs right now, if you’re in the same boat. 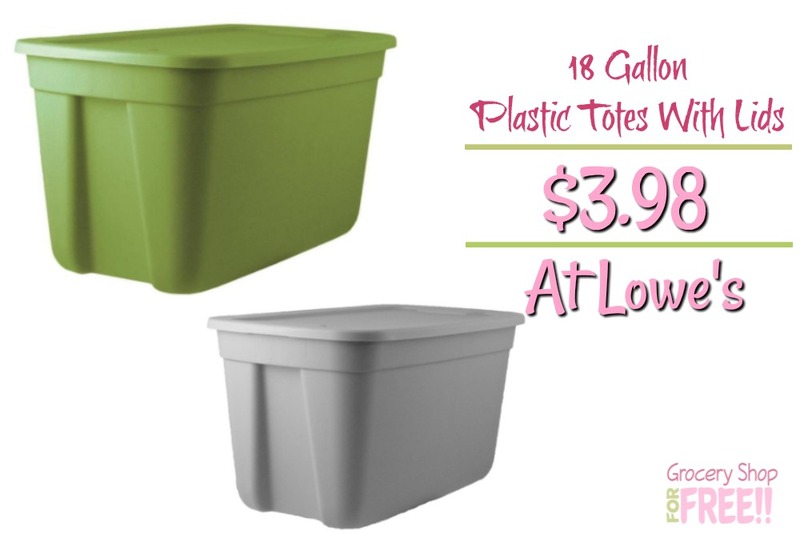 You can get these 18 Gallon plastic totes with lids at Lowe’s for just $3.98 right now! That’s about 1/2 price! Plus if you choose FREE in store pickup you don’t have to pay shipping! Economical storage in a fun fashion color! This 18 Gallon basic storage tote is the perfect size to store off season clothing and accessories. This tote has a standard snap lid, is stackable and is made in the USA.